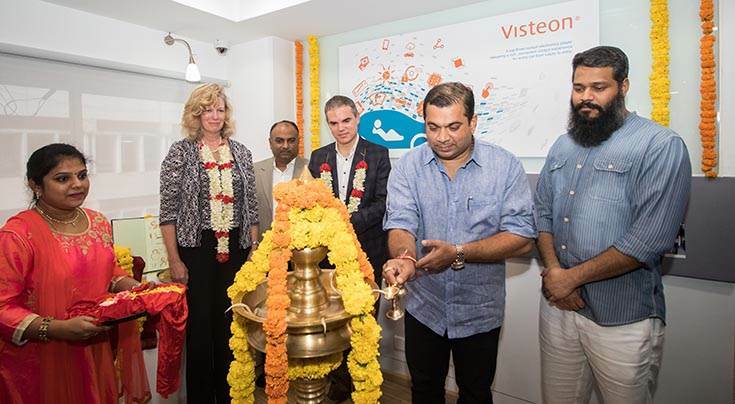 Visteon, the only Tier 1 automotive supplier focused exclusively on cockpit electronics, inaugurated its fourth India technical centre in Goa on November 1. The facility in Goa, will collaborate closely with Visteon’s technical centres in India and will support the company’s development of artificial intelligence software, advanced driver awareness systems and deep learning for autonomous vehicles. The inaugural ceremony was attended by delegates from the government of Goa including Rohan Khaunte, minister for Revenue, Information Technology, Labour and Employment and senior leaders from Visteon, including Matt Cole, senior vice-president product development; and Kristin Trecker, chief human resources officer. Rohan Khaunte and Matt Cole cut the ribbon at the opening ceremony. The new technology center in Panjim has a seating capacity of 50 with the potential for expansion. Visteon plans to fill majority of its open positions with graduates from local universities. Visteon, which recently premiered its SmartCore cockpit domain controller on the new Mercedes-Benz A-Class, is a global technology company that designs, engineers and manufactures innovative cockpit electronics products and connected car solutions for most of the world’s major vehicle manufacturers. It is a leading provider of instrument clusters, head-up displays, information displays, infotainment, audio systems, telematics, SmartCore cockpit domain controllers, and the DriveCore autonomous driving platform. Visteon also supplies embedded multimedia and smartphone connectivity software solutions to the global automotive industry. Headquartered in Van Buren Township, Michigan, Visteon has approximately 10,000 employees at more than 40 facilities in 18 countries. Visteon had sales of $3.15 billion in 2017.